CONCERNING the attack of the Royal army on Paris, all authorities, friendly or hostile, agree that it was a failure only redeemed by the splendid courage and tenacity of the Maid. On few other points is there agreement. We shall prefer the evidence of Jeanne herself, and of a cool observer within the walls of Paris. By both sides in the struggle there was an exhibition of the absent-minded fashion in which war was understood. " The Maid was never consulted," says a recent historian. On this occasion she manifestly was not obeyed, for she understood war better than the leaders, as will be shown. The citizens and clergy of Paris had been sworn by Bedford to loyalty on July 14, and again by the Chancellor of France under Bedford, Louis de Luxembourg, on August 26. Yet we have already seen that the members of the town militia did not begin to fortify their gates and outworks till early in September. On September 7 the Anglo-Burgundian Government raised money from the burgesses and ecclesiastics for the payment of the garrison, which appears to have been mainly Burgundian. A considerable garrison there must have been ; but even this is denied by a Burgundian writer, the " Bourgeois de Paris." D'Alencon had summoned the chief citizens by name to surrender, but they laughed at his letter. If we follow a Burgundian narrator, then in the city, the force of the King, under d'Alencon, de Laval, de Gaucourt, d'Albret, de Rais, Boussac, and the rest, consisted of 12,000 men, who certainly did not all come into action. They had great quantities charged with faggots and other things wherewith to fill up the moat ; but it is certain that, by a strange ignorance of war, the attack was made only at one point, between the gates St. Honore and St. Denys. We hear of no attack, or even feint elsewhere, though d'Alencon had bridged the Seine above Paris, and common sense dictated an assault, or at least a feint, on the south as well as on the north. The truth is that no serious assault was intended by the leaders. Men in earnest would have posted their guns and material under cloud of night, as the Maid did at Troyes ; would have begun the onset with dawn, as the Maid did at the outwork of the Orleans bridge-head. On the other hand, the army did not leave its quarters for Paris till after breakfast, at eight o'clock, and nothing was really attempted till two o'clock in the afternoon. If the leaders were in earnest, they certainly did not understand war as Jeanne understood it. But were they serious ? Were their heavy guns ever in action ? Was their display of siege material meant for more than a demonstration of force, to encourage a tumult of their partisans within the town ? The Maid herself told her judges that she had no orders of the day from her Voices, but "went at the request of the nobles, who desired to make une escannouche or vaillance, but she was determined to go farther and pass the fosses." The whole conduct or misconduct of the attempt--the late start, the general slackness, the puny attack on a single point, the ^yant of supports in the onslaught (the need of these is emphasised in Le Jouvencel, the military romance of the period), corroborate the words of the Maid. She vainly tried to turn a demonstration into an attack driven home. "Maluit et mutas agitare inglorius artes." 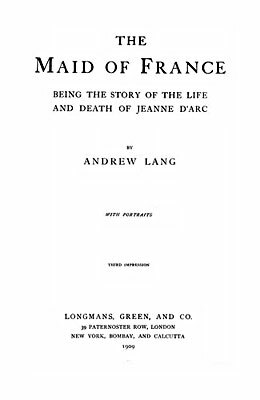 Anglo-Burgundian as he was, he closes his brief notes on the career of the Maid with the words, " God have pity and mercy on her soul ! " His account of the attempt on Paris agrees perfectly with Jeanne's own version, and deserves to be quoted in full. "On Thursday, September 8, the Feast of the Nativity of the Mother of God, the soldiers of Messire Charles de Valois assembled in great numbers near the walls of Paris, at the Porte Saint Honore rather hoping by a popular tumult to oppress and injure the town and the inhabitants, than to succeed by force of arms. About two hours after noon they began to make a semblance of an intention to assail the place. Hastily did some of the enemy at the swine-market and near the gate bring up long bourrees (bundles of wood) and faggots, and throw them into the outer trenches, which were dry; next into the ditches close to the walls, where the water was high." (Either there had been a flood, or the managers of the sluices had admitted a full current of water from the Seine.) "At this moment the disaffected or bribed people in the town raised shouts throughout the whole place on either side of the bridges, yelling that 'all is lost, that the enemy has entered ' : with cries of Sauve qui peut! "Thereon all the people in the churches at sermon were panic- stricken, and most of them fled to their houses and shut the doors ; there was no other commotion. Those who were appointed to that duty stayed on guard on the walls and at the gates, and others, coming up, made strong and good opposition to the men of Charles de Valois, who remained in the outer fosse, and without, at the swine-market, till ten or eleven o'clock, when they departed with loss, several of them being slain or wounded by gun shot and arrow shot. Among others a woman called the Pucelle, who was one of the leaders for Charles de Valois, was wounded in the leg by an arrow. The plan of the leaders was rather to injure Paris by a commotion within, than by armed assault for had they been four times more numerous than they were, or more, they could not have taken the place either by storm or siege, for it was well supplied with food, and the townsfolk and garrison were perfectly at one in the resistance, as it was reported that Charles de Valois had given up the place to be sacked, ordered a massacre of men and women of all ranks, and would plough the site of a town of Christian people, a thing not easily credible." This is not a picturesque, but is an authentic account of the events : the attack was neither serious nor supported, but an effort to cause tumult and surrender, a vaillance or escarmouche. The Maid was alone in her determination to force the fighting, as she herself averred. The French then moved as late as eight in the morning of the day of the Nativity of Our Lady, halted at a hill now or lately styled the Butte des Moulins or Windmill Hill, and there at the swine-market planted their guns, apparently out of range, behind the hill, at two in the afternoon ! It was not the wont of the Maid to watch a battle from the rear. She bore her standard through the deep dry moat, and, crossing the intervening space, she plumbed the water moat with her lance, under fire. The French ignorance of the depth of the water has been attributed to bad scouting ; but who could tell, from one day to another, how much water the moat contained ? That depended on the engineers of the defence. King Robert the Bruce was a cautious commander, and had investigated the depth of water in the moat of Perth before he attempted a night attack in January 131 3. But he, when the assault was made, had to fathom the moat with his lance, exactly as Jeanne did in broad daylight, and Bruce's heavy armed men could only find a ford where the water was throat high. The assault on Paris on September 8 failed exactly as Saintrailles and Dunois had failed at Jargeau in May, by reason of the deep water in the fosse, and the lack of portable bridges or light boats of any kind. That such boats were used as early as 1429 is not certain. We do not see them in pictures of sieges in the manuscripts of the day. If Poton and Dunois were so improvident at Jargeau, then, supposing that Boussac, d'Alengon, and the rest meant serious work at Paris, they were equally careless. Such things will happen. Napoleon had made no preparations for roughing the shoes of his cavalry horses against the frosts of a Russian campaign. Not a spike was nailed into the English guns at Waterloo by the French cavalry, who had them at their will; not an iron ramrod of a pistol was used to disable our artillery. These were fatal oversights ; but at Paris the French leaders had not meant to storm the place : they looked on to see whether or not the Maid's demonstration would be backed by an Armagnac mob within the town. The day went by as at the Tourelles, the Maid at the fosse, with her standard, in the heat of the fire, calling to the people to yield. According to her judges, she said " surrender to Jesus," according to the hostile "Bourgeois de Paris" she threatened them with massacre. Thereon a bowman, with the coarsest insults, aimed and sent an arrow through her leg, while with another he slew her standard-bearer. She was certainly wounded and placed under cover beside the moat, whence long after nightfall she kept crying on her men to the charge. But she herself could not move, the supports were far off, out of range, she could not lead them ; only her voice pierced the night. Still she called out that the place was theirs for the winning. At length de Gaucourt sent men who carried her out of fire, still protesting that with perseverance Paris would have been taken. The leaders had not her intentions, had not her tenacity ; the army did not come on, support following support, as far as we are informed. The dAlencon chronicler says that the French had only the slightest losses; he makes a miracle of it; but the Bourgeois avers that they lost five hundred men in killed or wounded ; that this was stated on oath by a herald who came next day, to ask leave to bury the dead. He also says, inconsistently, that the dead were carried away and burned. Obviously few of the dead were found by the defenders, who dared not sally out and pursue, as is admitted. "They cursed their Pucelle who had told them that certainly they would storm Paris, and that all who resisted would be put to the sword or burned in their houses." The same Bourgeois witness attributes the triumph to the townsfolk ; of men-at-arms, he says there were only forty or fifty English ! He was a vine-grower ; probably he passed the day in his cellars. We must find a happy mean between the rival fables of de Cagny and of the Bourgeois. We hear of no losses among the French nobles, of no wounded leader except the Maid. Probably she with the advanced guard and its leader de Rais, was alone actively engaged ; dAlencon came for her, says Chartier, from his safe position out of range. The whole story, as it has reached us, save from Fauquemberque and the Maid, is a mist of contemporary fable. In a Norman chronicle, written, apparently, within a year of the events, we are told that the artillery of Charles VII used noiseless gunpowder ! But, through the mist, one figure stands out clear in the sunlight, discerned alike by friend and foe; a girl of seventeen in white armour, who lets herself down into the deep dry fosse, who climbs out on to the dos d'dne under the city wall, and, like Bruce at Perth, fathoms the water of the great fosse with her lance, under a rain of projectiles, till she is smitten through the thigh. Undaunted, unweakened, she cries on the men. History shows no other such picture. There is evidence which appears indisputable that the French left behind hundreds of wheel-barrows and of scaling-ladders, with other siege material--which they had not used. But as they were not pursued, and as, but for the King's orders, con- veyed by princes of the blood, the Maid would next day have renewed the attack, it is the King, not the Maid, who is to blame for the loss of siege material. The army, returning to its post of September 8, would have recovered its material. But the army was forbidden to return. Jeanne's military fault, on her own showing, was her tenacious attempt to convert an escarmouche or vaillance--a display--into a determined attack, as some writers hold that she did, success- fully, at St. Loup. She paid for her courage in person and prestige. Here it must be noted that, concerning the conduct of the Maid at Paris, as later at Compiegne, and indeed from her victory at St. Pierre le Moustier to her capture, her judges brought many charges against her, while in the Trial of Rehabilitation (1450-1456) no witnesses were called in her defence. Pasquerel and d'Aulon were with her to the end ; but they were asked no questions on the operations of September 1429, May 1430.
of her Voices. But Dunois was asked at the Trial of Rehabilita- tion whether all her military predictions were fulfilled ? His reply was, " Though Jeanne sometimes spoke gaily about many matters of war, to raise the spirits of the men, and though perhaps all that she said of this kind was not fulfilled, yet, when she spoke seriously of war, and of her vocation," she confined herself to the relief of Orleans and the coronation. The Com- mission of 1450-1456 probably did not care to inquire too closely into this question ; or to distinguish between such words of encouragement as every leader uses, on one hand, and pro- fessedly inspired predictions on the other. Hence, one may guess, the gap in their inquiry. On the other hand, it may have been caused by reluctance to expose the imbecile behaviour of the King from his coronation till the capture of the Maid. To take Paris was avowedly part of the vocation of the Maid. She had been thwarted by diplomacy, otherwise the place would have fallen ; but still she did not despair. Despite her flesh- wound she rose very early on September 9, and begged d'Alencon to sound the trumpets and mount, " for I will never retreat till I have the town." D'Alencon and other captains were of like mind, but counsels were divided. While they were debating, the Baron de Montmorency, previously an adherent of the English, rode up with fifty or sixty gentlemen to join the company of the Maid. Her friends were greatly encouraged ; but then arrived Charles de Bourbon, with Rene\ Due de Bar. They bore the King's orders, the Maid must return to-SfcJQe»ys. The other leaders, like her, were summoned, and with heavy hearts they obeyed the Royal command. They still had it in their minds to make a new effort, crossing the Seine by a bridge which d'Alencon had caused to be constructed near St. Denys. On September 10, very early, they rode forth, only to find that by orders of Charles the bridge had been destroyed under cloud of night. Charles employed the next three days in councils of retreat. 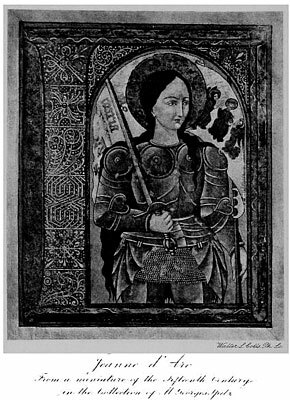 After dinner on September 13 he abandoned St. Denys, where the Maid, with a breaking heart, left her armour suspended in the cathedral before a statue of Our Lady. The Royal retreat was hasty and disorderly; by September 21, Charles was in the haven where he would be, dining at Gien on Loire. " And thus," says the dAlencon chronicler, " were broken the will of the Maid and the army of the King." He had made the great refusal. His garrison was soon driven out of St. Denys, and the enemy made spoil of the armour of the Maid. The sword of Fierbois had been broken by her, it is said by her application of the flat of the blade to the back of one of the leaguer-lasses with whom she waged war. This tale appears to be a fable. She would not tell her judges what became of the sword. According to Jeanne, she had the Fierbois sword at Lagny in April 1430, and later wore the sword of a Burgundian captive taken there ; a " good cutting blade." From her own account it does not appear that the mystic blade was that which she broke at St. Denys. It rather seems that, after her Voices warned her of her approaching capture, as they did in Easter week 1430, she laid aside the sword of Fierbois and her standard, that they might not fall with her into hostile hands. We do not hear that her standard was taken when she was captured. With the Royal retreat to the Loire the victories of the Maid in the field were almost ended. But the impetus which she had given to French energy, and the depression and weariness of war with which she had affected the English conquerors, survived not only her victories, but her life. Henceforth, with intervals of indolence, France pressed forward and England withdrew. Four years later Bedford gave to Henry VI a fair estimate of the gains which by his own confession her country owed mainly to Jeanne dArc. A mere fragment of Bedford's letter is very well known, Rymer published it, as of 1428, in the great collection of public documents called Fcedera (1710). Quicherat quoted it from Rymer, and conjecturally dated it in the end of July 1429. Rymer merely gives Bedford's account of the " great stroke upon your people " at Orleans, where they in numbers deserted ;--a stroke due " in great part, as I trow," to the panic caused by the Maid, and the encouragement given by her to the French. But Bedford's paper is really of December 1433, " the twelfth year of the reign of Henry VI." Bedford says that " by fair days and victories," after the death of Henry v, he had brought under English allegi- ance "great part of Brie, Champagne, the Auxerrois, Nivernais, Maconais, Anjou, Maine," " and all things there prospered for you " till the great stroke at Orleans. After that, " divers of your great cities and towns, as Reims, Troyes, Chalons, Laon, Sens, Provins, Senlis, Lagny, Creil, Beauvais, and the substance of the countries of Champagne, Beauce, and a part of Picardy, yielded without resistance or awaiting succours." With the aid of Beaufort's crusaders, he says, he took the field, and saved much of the country and Paris. Nevertheless the people in the English allegi- ance are ruined, and can neither till their lands and vines nor profit by their merchandise, and are " driven to an extreme poverty, such as they may not long abide." Bedford was therefore obliged to come to England (1433) to set forth his need of assistance. If he is not listened to, the French under English allegiance " shall be despaired," and each man will do his best for himself, that is, will return to his rightful King. France is "in notorious jeopardy" of being lost, despite the loyalty of Henry's French subjects, in which Bedford expresses a sanguine belief. Finally, he asks for money from the revenues of the Duchy of Lancaster, and offers to devote his own gains from the same source to the recovery of France. But the energy and self-sacrifice of Bedford were unavailing, and, by his confession, the successful reaction against England was" in great part " the result of the enthusiasm which, for four short months, centred in the Maid, whose impulse accomplished her task, though not in the brief space of her allotted year. Ignorant of the part of Bedford's letter which Rymer omitted, all historians have overlooked his recognition of the immense services of the Maid.